An aerial view of Matinicus Island seen from one of Penobscot Island Air's Cessna 206 planes in 2005. MATINICUS, Maine — On any other day, the four survivors of a plane crash off Matinicus might have been saved in minutes. But it was Sunday. That’s when the waters off the island are quiet and fishermen are at home. So pilot Roger Wolverton got involved. 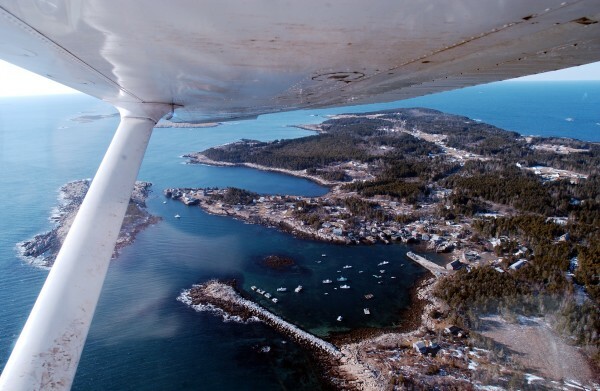 Wolverton, a 60-year-old pilot with Penobscot Island Air — a taxi service to midcoast islands — had just landed in Owls Head from another flight when he got an emergency phone call. One of the company’s planes had sent out an emergency signal around 5:30 p.m. Sunday, July 17. He called 911 dispatchers who couldn’t seem to contact the plane’s pilot, Robert Hoffman. “I flew straight out to Matinicus. We went to the strip and the plane wasn’t there,” said Wolverton, who’s from Union. So he circled the island. That’s when he saw them. Wolverton called 911 again and told them what he saw. He told the dispatcher to call the local fishermen for help. “Any other day of the week they would have been picked up in a minute. There would have been fishing boats everywhere. But on Matinicus, no one fishes on Sunday,” Wolverton said. Soon enough, though, fishermen Robert Young and Clayton Philbrook were out in their boats looking for Hoffman and his three passengers, Eva Murray, 47, of Matinicus, Abagail Read, 56, of Appleton and Karen Ford, 53, of Waterville. Within minutes, Wolverton saw the boats coming. They sped fast from the island’s east-facing harbor to the northern side of the island. Then they slowed dramatically, coming to a halt. “I realized they couldn’t see them,” Wolverton said. He dipped his plane down and circled low to the water until the boats came closer. Then the fishermen started loading in the passengers. Hoffman’s arm was injured and the fishermen had a hard time getting him into a boat. Philbrook said Hoffman likely hurt it when he smashed out his captain’s window and pulled out all three passengers as his plane sank. The fishermen had to lift the pilot into a boat by his belt. Once Wolverton knew the survivors would be safe, he flew toward the landing strip where he waited to take Hoffman and Murray to the mainland so they could get to a hospital. During the flight, the two victims said nothing. After all, they had been in cold water for almost an hour. Wolverton said nothing either. “My job was to just get them off the island as quick as I could,” he said. Another pilot grabbed Ford, and Wolverton made a second trip to the island to get Read. As of Wednesday, Murray and Read were both in Maine Medical Center in Portland. Murray was in satisfactory condition and Read was in fair condition. Ford was in Central Maine Medical Center in Lewiston and the hospital would not release her condition at the request of her family. Wolverton is not a boastful man. Any pilot would have done the same, he’ll tell you. But his 30 years of experience and 12 years flying for the Maine Warden Service may have helped with the quick response to the crash. “I’ve done a lot of search and rescue. I’ve been on several plane crashes. No one wants to, but by virtue, I had experience at that. I dealt with a lot of airplane crashes as a warden,” he said. After Sunday’s crash, Wolverton flew again on Monday and Tuesday and will fly Cessnas out of Owls Head again Thursday. This one incident doesn’t make him feel any different about flying. In fact, the support from the community has been overwhelming, he said. Some people have canceled their ferry rides and instead scheduled flights “to make a statement,” he said. Penobscot Island Air still is not sure what caused the accident. The plane’s power shut off about 150 meters after it took off from the Matinicus airstrip. Hoffman “ditched” the plane by catching some wind and doing a water landing. Hoffman then helped all his passengers out of the plane through his captain’s window, according to the Knox County Sheriff’s Office. The Sheriff’s Office is investigating the crash with the U.S. Coast Guard, Maine Marine Patrol, Maine State Police, Federal Aviation Administration and the National Transportation Safety Board. Fishermen Nick Philbrook, Charlie Rogers, Edwin Mitchell and Josh Ames also responded to the crash on Sunday. Penobscot Island Air will be pulling the plane off the bottom of the ocean floor on Friday.